That's the game that's not Star Wars: Battlefront III. 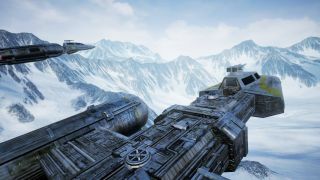 Galaxy in Turmoil, you'll remember, is the fan-made Star Wars: Battlefront that—thanks to the intervention of lawyers—now has nothing to do with Star Wars, meaning it's now set it's own sci-fi universe. It's getting a demo next year, but ahead of that, maybe you fancy a quick look at one of its maps? As in, a very quick look, preceded by some backstory revealing that the Nak-Thi map mixes wintry snow with a big old volcano—an interesting combination, I'm sure you'll agree. There's also a station present, and some ships passing over it; OK, so it's a bit of a teasing video, but it's our first proper look at GIT (I do love that acronym) since it ditched the Star Wars connection, and I'm pleased to report that, visually, it looks quite nice.